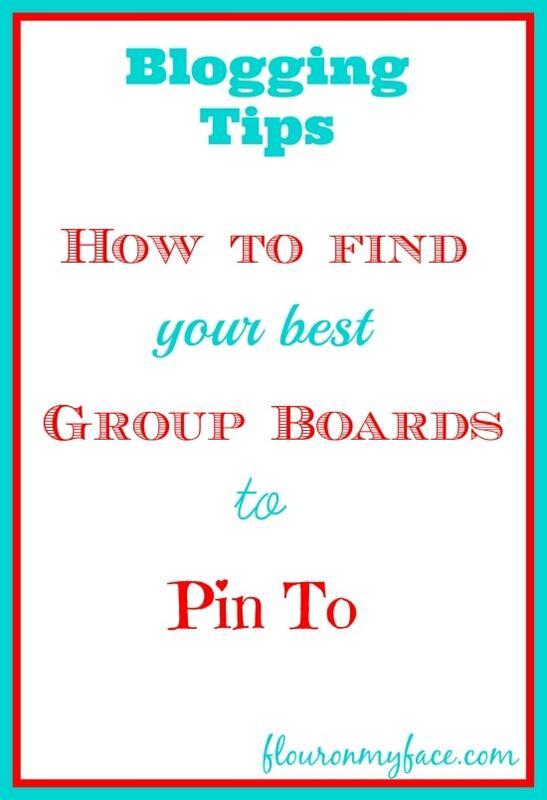 Recently while I was playing around on the free Tailwind App I found a very easy way of how to find the best Pinterest group board to pin to based on the number of repins a group board gets. If you are serious about blogging or trying to make a living at it you know Pinterest is the most important social media site out there at the moment. I try to find ways to make what little time I have to spend while sharing on social media sites to count as much as possible. I belong to many Pinterest group boards.
. There are some great Pinterest apps that can help you get the most out of Pinterest. I have an account on most of them but not all of them and I like a free app over a pay app any day. The TailwindApp is what I will be using today to show you How to find the Best Group Board to Pin To. There are two types of accounts available. One is a free Tailwind account that doesn’t require a credit card and that is what I will be using today. The Tailwind Plus plan is available for about $29 a month and is perfect for bloggers. There are many stats avaailble to help you with your Pinterest strategy. A Pro Account is available for big businesses for $99 a month and that type of account will open all of the Tailwind statistic available. The TailwindApp Tools I will be using are available on the free account and if you click this link you can get a free month of Tailwind if you don’t already have one. It takes a short time for some of the stats to show up in your new account. Others take longer and you will get a message or email when they are available. Updated September 2014 >>>Your Profile is now shown under the Profile Performance tab. Followers: Number of followers and a nice colorful graph showing how many new followers you’ve gained in the past 7 days. Pins: Total number of pins since you’ve joined Pinterest and the number of pins you’ve had in the past 7 days. Repins: Shows the number of repins since joining Pinterest & number of repins in the last 7 days. Upgrade to the Pro account and you can unlock more historical data like number of likes and repins. Likes: Shows total number of likes since joining Pinterest and number of likes for the last 7 days. Upgrade to the Pro Account and you can unlock more historical data. As you can see from the photo above the TailwindApp applies a score to your Pinterest account. What do the TailwindApp Scores mean? What does your Virility Engagement Score mean? Engagement score is a measure of your audiences engagement with your pins, giving you insight into how much interaction your pins are receiving from each follower. 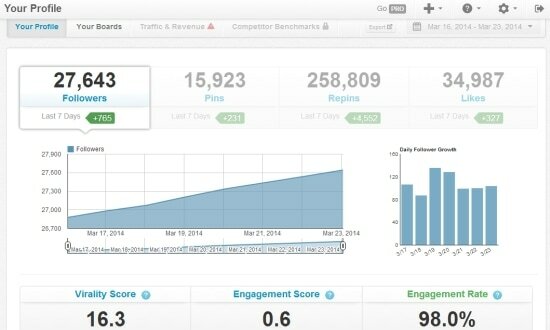 Engagement Rate = Engagement rate is measure based on how many of your pins have at least 1 repin versus 0 repins. What does it mean? Engagement rate is a way for you to see how well your content is resonating with your followers. These scores are a nice way to quickly see how well you are on track on Pinterest. My 98% Engagement rate tells me that almost all of my pins and repins appeal to my followers. Almost everyone of my pins get repinned at least once. Updated September 2014>>Board View is now found under the Board Insights tab at the top of your Profile page. 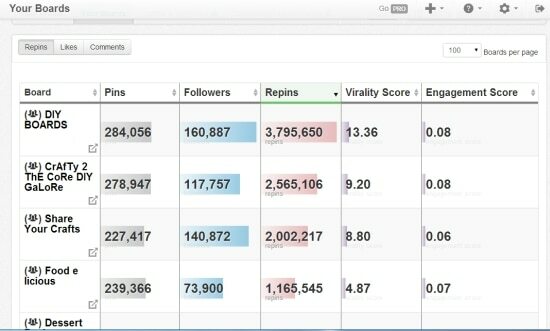 Your Tailwinds Boards Insight view is broken down into 5 sections each with a tab assigned for Pins, Followers, Repins, Virality Score and Engagement Score. 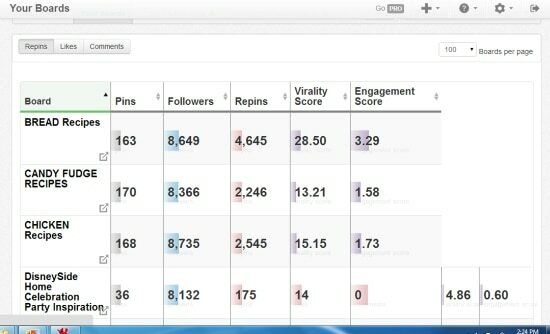 You can then check the statistics for each boards Pins, Followers, Repins, Virility Score and Engagement score. You can click on each section and it will change the view and move the statistics around making it easier to find which statistic you are interested in. You can also do this by clicking on the arrows on each heading title. This is the section where I like to break things down to get an idea of how well my pins are doing and which board could generate the most repins for me. Your own Pin statistics is a whole other blog post. For today I am just sharing how to find the best group board to pin to using the free TailwindApp. Once you get the hang of it you can go back into your account and check out which of your boards and pins are getting the most traffic. Nothing is guaranteed here but in all likelihood the board that generates the most overall repins is a board that will promise you the most repins for each pin you pin to it. You can also set the boards order based on each statistic. How I find the group board that has the most repins therefor allowing me to know which group board I am likely to get the most repins from when I pin my own content to it. Click on the down arrow on the Boards Tab and it puts all your boards in alphabetical order starting with the letter A. This view will show all your own boards first then your group boards will follow also in alphabetical order. Click on the up arrow on the Boards Tab and it puts all your boards in backwards alphabetical order from Z. Note: When you click the up arrow and it sorts your Pinterest boards alphabetically backwards it also puts your group boards in a backwards order starting with last letter in the alphabet based on your group board names. In this view your group boards are the first boards in the list. Each page in the listview is limited to 100 boards. I have over 250 boards closer to 300. For those of you who have less boards this won’t be an issue but for me I don’t want to have to keep clicking the next page arrow. I need to quickly find the most important board for repins. How I use the Free Tailwind App to find the Top 10 Pinterest Group Boards for the most repin potential. Follow the previous steps to view the first page showing the top 100 Pinterest Group Boards that you belong to. I belong to about 140+ group boards. Yes I know that is a lot of group boards but my niche is food blogging and there are many many more group boards that I could belong to. I am currently looking for a 12 step program. If you know of one please let me know! As soon as I have time I am going to be weeding out some of the group boards I belong to that are not beneficial to me. The problem with that is although they may not get me as many repins or new followers as other boards I belong to the topic they cover is a topic I have occasional need for and will probably pin to eventually. Update September 2014>> 6 months later and my top 4 boards for repins are still the same. I need to focus on those boards. To find the board that you are likely to get the most repins on head over to the tab for the repins. Click on the up arrow and now those Group boards are listed by the most repins. It changes the order of the group boards because the board with the most repins is not the group board that was in the backward alphabetical order obviously. Take a quick look to see which is the #1 group board with the most repins. For me it is a large DIY Board group board. This doesn’t surprise me there are almost 168K followers. Believe it or not but this is not one of the largest group board I am on. You would think that the board with the largest number of followers would get the most repins. This is not always true. This DIY Group Board has a staggering 3.8 million repins (September update 7.8+ million repins)! My niche is food blogging but this DIY board also allows recipe pins. I pin my recipes and occasional DIY content to it frequently. Today I am trying to figure out which is my top ten total food related group boards for repins. Even though this board allows recipes pins I am just looking for Food or Recipe Group boards so I am going to ignore that board for now. To find the Food or Recipe Group boards I went down the list of group boards and wrote down the top 10 Food & Recipe group boards I belong to that has the highest number of repins. I did this in a little notebook that I keep by my side while I am working. The next time I get ready to pin a recipe from my food blog I will look at that list to find the best food related group board to pin my content to that will give me the highest repin potential. Guess what I found out? I discovered by using this method that I have not been taking advantage of my best recipe group board. The board with the highest numbers of repins is a board that I do not pin to that often. That is going to change right now. September 2014 update>> Trending Pins is no longer available to the Tailwindapp free account. You will have to upgrade to take advantage of these analytics. I’ve only took a quick peek at the trending pin option and I am not sure how accurate it is but this option allows you to see which one of your pins are doing the best on pinterest in the past 24 hours. It shows how many times the image has been repinned and who repinned it. I will have to test this out but I think this might be a good way to track down a viral pin and find out who repinned it first. 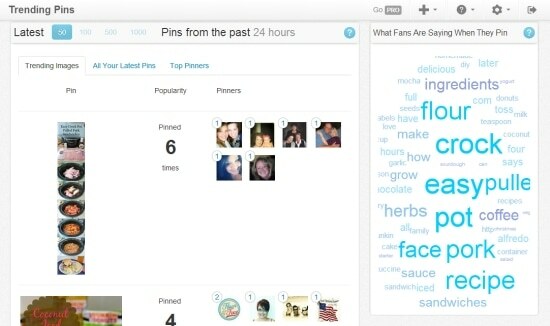 The TailwindApp Trending Pins also shows a Word Cloud with all the word associated with the descriptions of your pins. I’m a very visual person so this really helps me see at a glance the words that are being used in descriptions of my content when they are pinned. Check the TailwindApp out and leave me a comment letting me know if you found any surprises when you use my How to find the Best Group Board to Pin to TailwindApp trick. Update 2018 I have stopped using ViralTag and Ahalogy completely and now the only app I use to schedule pins to Pinterest is Tailwind. One of the best new features of the Tailwind Pinterest scheduling app is the new Tribes feature. I have been using the Tailwind Tribes feature since it was out in Beta. Melissa Thank you and thanks for stopping by! Very cool! Thanks for sharing all the info. I’m going to check out the app and hopefully figure out the best group boards for my own content. There goes my afternoon! You might wanna check PinGroupie which is a free web app, that lets you search within 40000 group boards. It is very easy to find niche specific boards. Thanks for your nice article!